The drought-stricken city announced on Thursday that it will begin marking 200 collection points where its 3.7 million residents will be required to queue for a rationed supply of water on “Day Zero” – currently forecast to be April 21. “We have reached a point of no return,” Cape Town Mayor Patricia de Lille told a press briefing on Thursday. Climate change is believed to be one of the factors causing Cape Town to have a growing number of dry seasons. Last year’s drought was one of the worst in several decades. 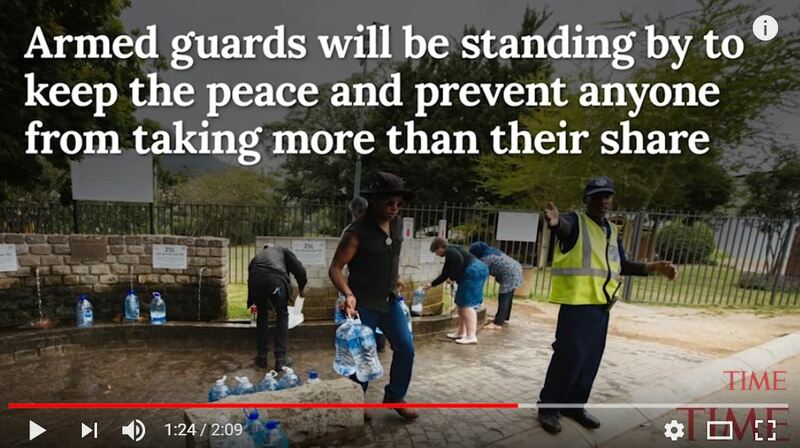 Under the plans for Day Zero, each resident of Cape Town would be allowed only 25 litres [6.6 gallons] of water per day, which must be collected from neighbourhood taps. Each supply point would be shared by about 20,000 people per day. The city is consulting police and army officials to decide how to maintain law and order at the collection points. To avoid this disaster, the city is now asking residents to limit themselves to 50 litres per day. But voluntary appeals haven’t worked in the past. When the city earlier pleaded with them to limit themselves to 87 litres [23 gallons, which is a lot] per day, only 39 per cent of residents complied. For more than a year, Capetonians have been banned from using water for swimming pools, watering gardens or washing cars. But the measures haven’t solved the problem, and the restrictions have been increasingly tightened. Officials have been trying to reduce the city’s water consumption to 500 million litres per day, less than half of normal use. “For each day that Cape Town uses more than 500 million litres, the city moves closer to Day Zero,” Ms. de Lille said. The Cape Town government, run by the Democratic Alliance, the main opposition party in national politics, has been criticized for its ineffective response to the water crisis. It had recently announced a drought levy on all water users, but on Thursday it scrapped the plan after widespread complaints. There was a “massive outcry,” the mayor said.